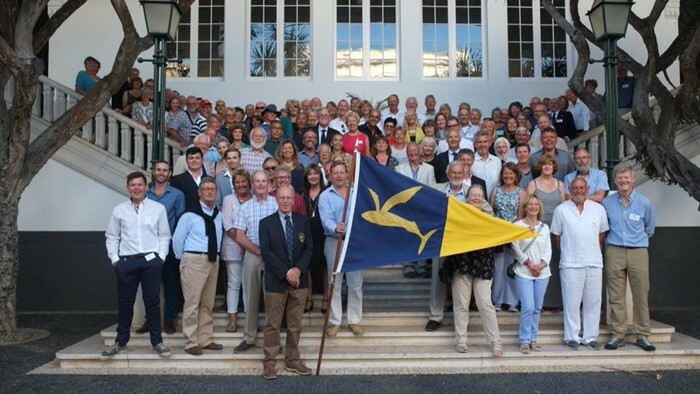 Forty-six boats from 11 countries descended on Horta to help celebrate the centenary of Peter Cafe Sport! First across the line (closest to noon on Monday 18th June) was Al Shaheen at 11:59:59, followed by *Intrepidous at 11:59:50, and Indulgence at 12:01:20. But the weighted finishers (closest to noon with least engine hours) were *Embellie (2mins14sec from finish time with only 11.5 engine hours); Taniwani (12 mins5sec with 16.2 engine hours) and *Gregal Cuarto (14mins37sec with 19 engine hours). And of course, the extremely popular 1st RIB over the line, 6 Aussies in a dinghy flying both the Australian and Rally flags! The flavour of the Rally was definitely international: we had boats from Japan (first boat from Japan on an OCC Rally), Australia, New Zealand, France, Portugal, Spain, Canaries, Germany, Canada, USA and UK attending, with the furthest distance travelled being 2738nm – slowest passage at an average of 2.8kn and the fastest at 6.8 average! There were five single-handed sailors (although one hadn’t planned to be! ), 11 associates completed their qualifying passages, and some 11 new members signed up at the Rally - with more to come. Excellent contacts with French, Portuguese and Canaries delegates bode well for future combined rallies in those areas! The media were well represented, with coverage from a French sailing magazine, some 13 hours of video interviews by Goncalo Tocha to be made into a full length feature, and footage from a drone flown overhead the finish. Plus gazillions of photos from individual members! The activities were well received, be they hectic bike rides down the side of the caldera (old volcano), treks through the Levadas above the town, whale-watching with superb sightings. No major medical hassles, although we did have two participants in hospital at various time and John Franklin got hit by a traffic boom coming down and needed immediate dental work to rebuild his teeth – the medical facilities were great and very much appreciated. Even more appreciated was all the hospitality and generosity from the Azoreans: the Marina gave us free berthing for all rally boats for a week, the Mayoral Council laid on a spectacular pig roast Monday night, Peter Café Sport gave us a superb dinner Tuesday night, and the Tourism Board gave us a huge spread on Wednesday night – plus gave each boat a brass plaque enscribed with boat name and Azores Pursuit Rally. Not bad when you consider it only cost a participant £50 per boat plus £25 per crew. The Rally flag was a big hit: we had 20 flying around the marina and in town, and each Rally boat had one. There were umpteen requests from total strangers who came into the office wanting to buy one! Jose Henrique Azevedo was the most tireless host: his team at Peter Café Sport are efficient, helpful, cheerful, never-endingly available and a real credit to him – and he topped the final dinner off with a presentation to each boat of a beautiful medal and pin. All in all, it was a wonderful experience and a truly wonderful Rally. Photo: Final Awards Dinner in Horta - great fun evening! Thanks to Goncalvo for photo. Watch the finish line video on YouTube https://youtu.be/IR0H0TEVynk.